I mentioned in yesterday's post that I bought the Nurse Jamie Uplift Facial Massaging Beauty Roller before it went into the sale!I have wanted it for well over a year, basically ever since I saw Tati talk about it and use it in some of her videos. When I saw the limited edition Cult Beauty birthday edition, I decided to bite the bullet and treat myself (I wish I had waited a little longer as it's now reduced to £35!). The reason I was particularly interested in this tool is that it looked like it would be a lot easier to use than the Sarah Chapman Facialift tool, which I reviewed here. 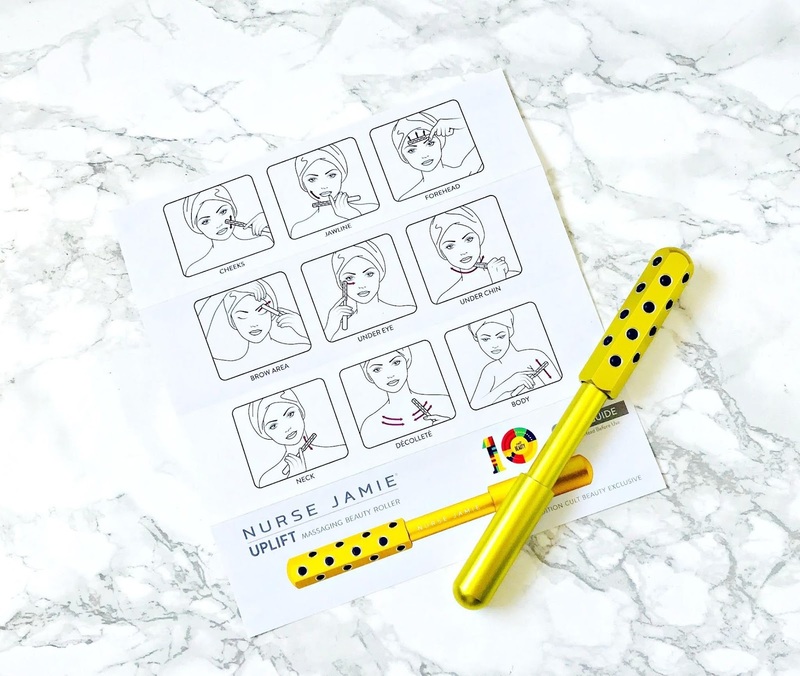 I have seen the benefits that massaging your face gives but the Nurse Jamie Uplift Facial Massaging Beauty Roller has added benefits and is quicker and easier to use. Massaging the face and neck stimulates blood flow, energises the skin, drains and lifts the skin but how many of us take the time to do it daily? Whenever I have a facial, I promise myself that I will replicate the actions of the therapist at home because the massage always beings the glow but inevitably, I don't. What is brilliant about this gadget is that it makes massaging so quick and easy. It can be done anywhere, the roller doesn't need charging or batteries and is even slim enough to pop in your handbag. On one end is the handle and on the other, the massage tool, which contains 24 tourmaline quartz stones, which help to stimulate skin cells. It instantly feels cooling on the skin, which makes the massage experience all the more beautiful - particularly over the past 5 weeks of high temperatures and humidity. A 'how to' guide is included, which shows the direction that the tool should be used in on each area of the face and neck and the advice is to massage each area for 30-45 seconds. It can also be used on the body, although I wish a larger one was available for the body. I always begin with my under eye area and it works wonders in this area. My eyes have been prone to puffiness in the mornings during the heatwave but once I use this, the whole area looks fresher and the puffiness is diminished. I keep the tool beside my bed and as soon as I wake up, I start working on my eyes - under eye and then brow. The cool feeling of the stones is a very welcome relief - my eyes feel soothed and look less puffy. I then move on to my forehead, then down to my cheeks and jawline - I pay special attention to my jaw and chin area to keep the dreaded jowls at bay! Because of my illness, my lymph nodes are almost always enlarged so I am very careful around my neck and collar bone but I do use it on my décolleté. On nights where I apply an oil, I use this to massage it in. I cannot speak of long term results just yet but in the short term, my face is most definitely less puffy and looks plump and has that post-facial glow when I use this roller. I think it would be amazing on long haul flights or on a jet-lagged or hungover face. I find it particularly soothing and useful when I have a headache instead of taking any paracetamol and it's also very relaxing on the back of the neck/shoulders if you are suffering from tension. This is worth the hype and I actually look forward to using it daily (sometimes twice daily!). Because it is so convenient, I can see myself using it for the foreseeable future and it definitely doesn't fall into the 'just another beauty tool that you'll eventually get bored of' category for me. Do you massage your face? Does this sound of interest to you? If so, grab it here while it's reduced!